Boxes are stackable for maximum storage efficiency. Made of thermoset polyester composite material. Flame and chemical resistant. 332100 3" deep stacking molded fiberglass box, 17" x 24 3/8" inside dimensions, 18" x 24 7/8" outside dimensions. A208505 1" deep tray, 16 1/4" x 24 3/8" inside dimensions, 17 7/8" x 25 3/4" outside dimensions. A208506 3" deep stacking molded fiberglass box, 15 7/8" x 23 7/8" inside dimensions, 17 3/4" x 25 3/4" outside dimensions. 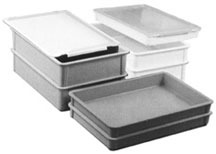 A208507 4 1/2" deep stacking molded fiberglass box, 15 7/8" x 23 7/8" inside dimensions, 17 3/4" x 25 3/4" outside dimensions. A208508 6" deep stacking molded fiberglass box, 15 7/8" x 23 7/8" inside dimensions, 17 3/4" x 25 3/4" outside dimensions. A208513 lid, 17 3/4" x 25 3/4" outside dimensions. Fits models A208506, A208507, and A208508 stacking boxes.